We receive a lot of questions regarding the basic blacksmith course, so I thought I would run over the common questions by reviewing the course. Your instructors throughout the course will be experienced ABASA members. 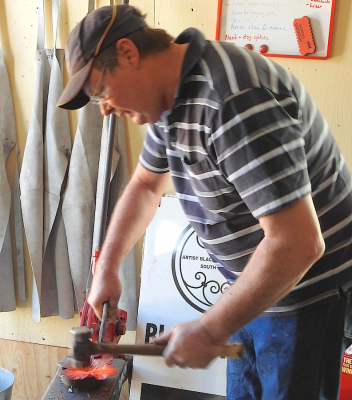 John Fergus (Top Photo) is one of our instructors, he is a spring maker by trade and an artist blacksmith by choice. He has been a member of A.B.A.S.A. 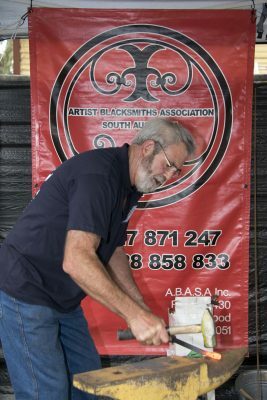 for many years and has been very instrumental in establishing our basic blacksmith course. John has developed the six-week course into a well honed and enjoyable experience. Chris Fuller (Lower Photo) is our other instructor. Chris has been with ABASA almost from the beginning. As an owner operator of his own full time blacksmith business ‘Artist Blacksmith Studio‘, Chris has created many beautiful and well forged artwork pieces for private and business customers in South Australia. The basic course has an Introduction Day that is mandatory to attend. This will occur on the Sunday prior to the first Wednesday night of the course. It runs from 10am till 3 pm. On this important day, students will learn about safety, the forge fire, forge etiquette and tools of the blacksmith trade. You will also get to meet and greet with fellow students over a BBQ lunch (provided as part of the course) and if time allows, the forges will be fired up for some fun at the anvil. Wednesday nights start at 6:30pm and finish at 9pm. On the first night, you will learn the basics of hammer control and use of the anvil to forge your steel to shape. The curriculum is not locked in steel, so to speak, as there is the flexibility in the course for students to work within their capabilities and strengths. At the end of the course, the basic facets of hand forging will have been covered including drawing down, twisting, upsetting, punching, drifting, bending and scrolling. The new smith will have hand forged some objects of art to show for their labours, and have the knowledge to begin their quest into the ancient art of blacksmithing. With the success of the condensed course introduced in 2017, we will be scheduling 4 courses that run over a six week period ( one night each week) and 2 condensed courses running over a Saturday and Sunday, back to back (16 hours). The condensed course is structured for those who are unable to attend the weekly courses. The cost of the courses is $300. Students becoming a FULL member of ABASA for three months from the start date of the course. This will give students the added benefit of attending the weekend Saturday forge workshops to practice their hammer and forging skills and finish any projects undertaken during the course. The ABASA Training Coordinator- Merv Lewis, will be the sole contact person for taking course bookings and handling the registrations of students who wish to undertake the courses. Merv will send out the registration forms for you to complete and send back. The forms will include all the details of the course, payment details and basic information concerning the course. Merv’s contact number is 0407 448 399.